Dutch pair, Jean-Paul Grobben and Serge Dusault are a formidable modern production force. Conceived in 2007 as Sed Project, over time the duo have gradually compiled a body of work which first bore fruit on Particles with a dark and menacing remix of fellow Dutchman, Exoplanet and his track "Fenomeen". Since then, Sed Project's ability to craft unique musical sculptures, fulfilling their self-confessed "story-teller" status, has been a rarefied success. 2011's "Future Able" EP featuring the vocal talents of Door Visser and Lisette van den Berg provided an intriguing snapshot inside the minds of the pair and also led to a raft of high-calibre remixes from Aeron Aether, Nick Hogendoorn and Exoplanet himself. 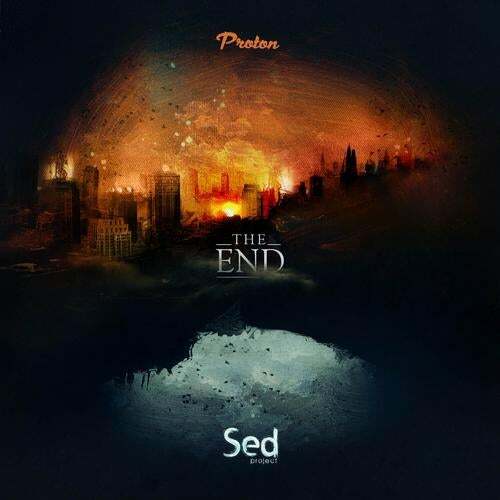 Now, after an initial 'tongue-in-cheek' independent launch on the apocalyptic Mayan date of 12.12.12, Proton Music is thrilled to announce the full release of Sed Project's first full-length album, "The End", complete with the hugely impressive rich and textured artwork from Hessel Stuut and its echoes of British 17th century artist, Joseph Turner. Inspired by "shining the light on darker things", Sed Project's outwardly happy personas are juxtaposed against the melancholy realities of everyday existence, taken shape in the abstract notions of love, life and death. These themes are then played out across the ten-track album in unparalleled skill and verve. The enigmatic guitar riffs of Paul Davids are expertly meshed against the electronic textures and deep emotive vibes of the opener, "When Worlds Collide Part I" while the beautiful piano of "Part II" echo the melodic themes of its predecessor. Vocalists, Door Visser and Lisette van den Berg take centre stage on the works "Desire You", "Cross" and "Lullaby", each accompanied by the impressive production techniques of Grobben and Dusault and their immaculate sense of rhythm, texture and composition. The dark, dance oriented album taster, "Some Will Figure" also makes a welcome return here, this time taking its rightful place within the context of a conceptual album where even greater pleasure is derived from its former presence in splendid isolation. With a body of work of which the Dutch maestros can be immensely proud, this is certainly not "The End" of Sed Project's combined talents.